ultimately improve their quality of life. chemical control, KOLON prepared and began to implement multiple strategies. Other environmental efforts made by the company include continuous monitoring and investment in air, water, waste, and hazardous substance control. 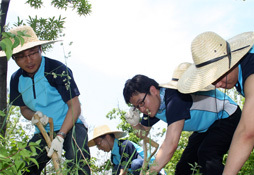 To become an environmentally conscious and socially responsible company, under the motto, “Dream and Love with Nature,” KOLON Industries, Inc. has been implementing cleaning activities in the parks and other landmarks close to the head office and locations twice each year, as well as an environmental protection campaign to raise local residents’ awareness. In 2004, KOLON Industries, Inc. began the construction of “KOLON Industry Forest” in part of the 1,150,000 square meter land of Seoul Forest, which was created in Ttukseom to build an urban eco park and restore forests in Seoul. The company is also participating in a variety of environmental activities, such as the environmental events of the foundation and sponsoring the climate change center. Other efforts made by the company, such as cleaning sister-villages close to each plant, creating flower paths, cleaning around each plant, and supporting the local nature study center, helps polish KOLON’s image as a clean company that works with its local community. In 1999, the company joined the international environment association called Responsible Care to better practice environmental management. Responsible Care is an international movement led by chemical companies to protect the environment and people throughout the entire life cycle of chemicals, from development to manufacturing, sale, distribution, usage and to disposal, and implement environmental, safety, and health measures for continuous improvement. The most important step in implementing RC is to remind all employees of the determination of CEO and management to implement RC, so that the employees share the philosophy and significance of RC. As seen in other countries and companies where RC has been enforced first, the management’s interest and support has a direct impact on the success of RC. Since all employees are supposed to participate in Responsible Care, KOLON Industries, Inc. organizes a team consisting of a team manager and members. The company also appoints a person responsible (coordinator) for exchange of information with the RC Team, the office of the Korea RC Council, and other member companies. makes gradual environmental, safety, and health improvements. with the RC Team, the office of the Korea RC Council, and other member companies. results of KOLON Industries, Inc.’s self-assessment are submitted to the Korea RC Council.